Ok. So as we're continuing to learn together, Zap has pointed out to me, that with unified sampling, you can actually get away with using fewer individual samples and it seems to still maintain the integrity of the rendering. I managed to actually get really fast renders using unified with low glossy/DOF samples but they turned out quite grainy. Because mr and vr are not a 1:1 relationship...there are so many different things going on to really compare. I decided, rather than compare render speed/time, to make comparisons on the image alone. So my approach for this test was that I would shoot for the same render time for both engines. Taking this approach removes the argument that one is faster than the other. This way I can focus purely on the quality of the image. Based on similar times, you can see the disparity between the two. Trying to ignore the DOF and moBlur between the two and focusing on sampling, there is actually not that much difference. 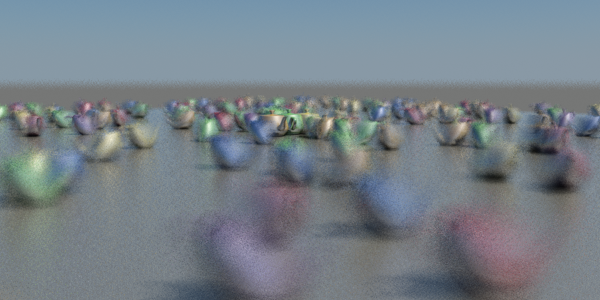 However I noticed that Vray seems or appears to have somewhat of a Gaussian blur look or filter to its sampling. While unified looks sharper, it also appears more noisy. I've noticed this is really evident in shadow samples from mrSkyPortals as an example. Perhaps there is a way to create a blurring of these samples at a 2D level without blurring the 3D image. So there is no answer here, but more an open ended thought. Try to change the Size Filter in MentalRay to Box 1.1. It will smooth the image. This is probably exactly what I asked for doing. But it's not quite what I ws looking for. 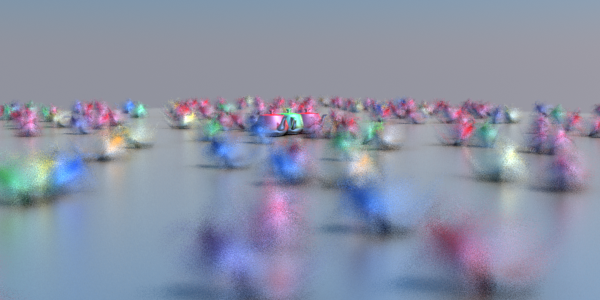 Doing this simply blurs the image too much rather than smoothing the samples out. Thanks for the comment...sometimes the most obvious solutions come from someone else! Yes, its true. Using box1.1 blurs the image too much, but if you try Mitchel size 4 or Triangle size 2 (the default values) you will get sharper results without the noise. Somehow unified sampling does not filter the image the same way that mr Adaptative sampling. Smax, triangle and mitchell really seem to do the trick! Unified seems to continue unveil rendering surprises ;) Thanks for pointing this out! I have found that using a Gausian filter size of 2x2 works even better! It's my default setting now.